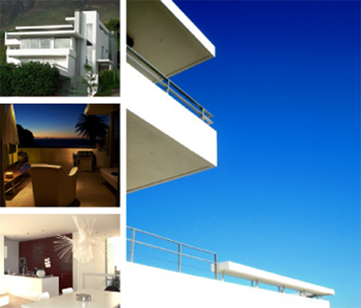 We are a dedicated and experienced team with a range of creative and practical talents specialized in the residential sector in and around Cape Town. Our work, for both local and international clients with a diverse range of expectations, includes not only superb design and comprehensive services, but also approval applications to the local authorities for the amendment of title deed restrictions to permit subdivisions, additional dwellings or land-use changes. If you are considering building or buying a property, or making changes to an existing one, trust us with your specific requirements. No job is too small or too large and we offer efficient and expert guidance in every one. Whether you require a full or partial professional service, our work will be tailored to suit your personal vision and needs. Included on our website is a selection of some of our many completed buildings and images of those still at the planning or approval stage. You will also find, for your convenience, the SA Institute for Architecture client / architect agreement and gazetted fee scale.